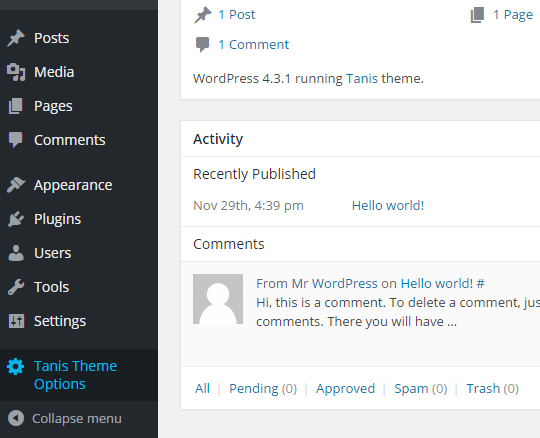 Today I’m going to present you a new WordPress Coming Soon Theme called Tanis and made with Bootstrap. Just like Mira and Alissa, this template will help you create a “Coming Soon” landing page for presenting your new product or website and building your email list. You can do all of this easily in a few minutes from the Tanis Options Page. Tanis comes with a responsive layout, fullscreen backgrounds (slideshow also available), countdown timer, working email subscription form (with MailChimp integration), working contact form, Google map, Font Awesome icons, and more. Below you’ll find the live preview link, the purchase link, the list of features and a review of the Options Page. 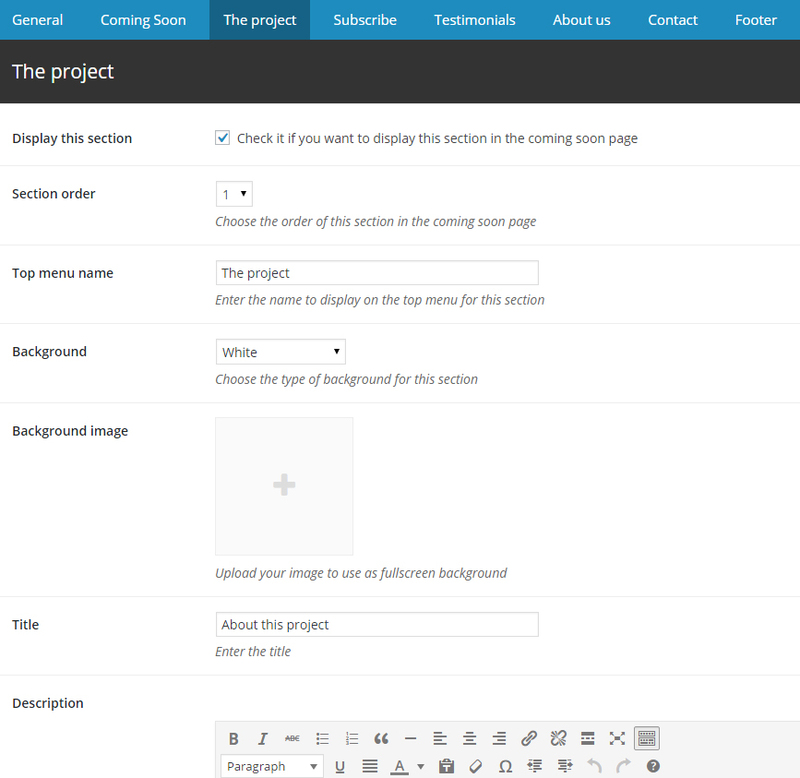 I’ll assume that you already know how to install and activate a WordPress theme. If not, just let me know. To access the Tanis Options page just click on the “Tanis Theme Options” item in the left menu inside the WordPress Admin panel. The Options page is organized in different tabs, each one (except the General tab) controls a specific section of the coming soon page. 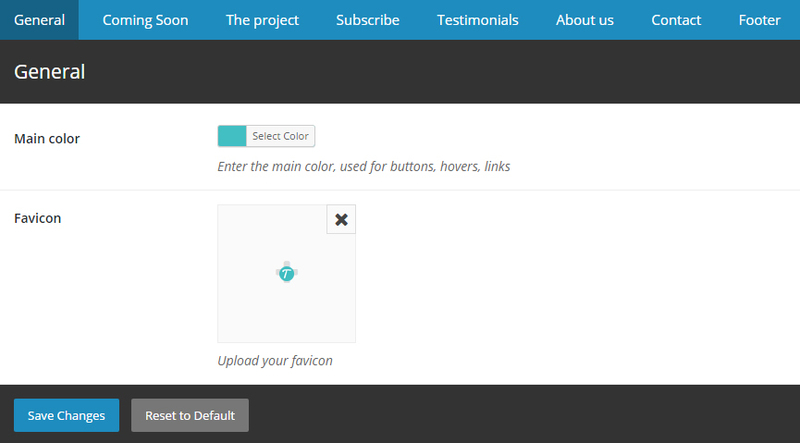 From the General tab you can set up the main color used for the buttons, hovers and links, and you can upload a favicon. In the Coming Soon tab you can set up the coming soon section of the page. In this tab you can enter the name to use in the top menu for this section, upload the images for the background slideshow (up to 5 images), upload the logo, enter the text (a title and a description) and set up the countdown timer. The next 5 tabs (The project, Subscribe, Testimonials, About us, Contact) refer to sections (with same names) of the page that can be ordered or disabled. You can also decide the type of background to use for these sections: white or fullscreen image. Along with these options you can customize the text and icons depending on the type of section. Each section (tab) has an option where you can enter the text you want to display on the top menu for that section. 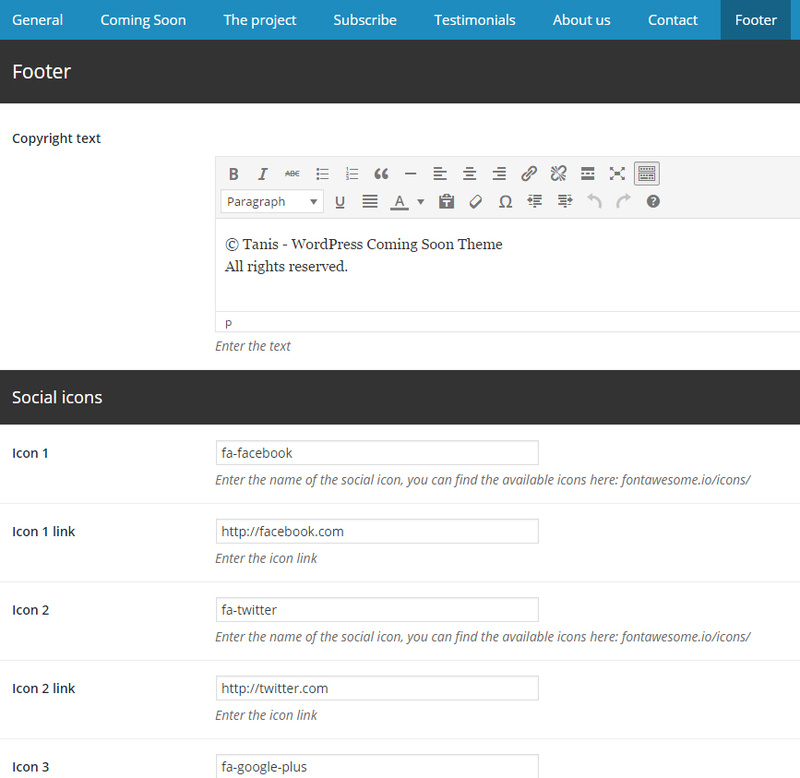 In this tab you can enter the copyright text and set up the social icons. You can add up to 6 icons with links. I hope you like this theme and find it useful for your projects! If you have any question, suggestion or you just want to say “Hi”, please leave a comment in the form below.